Tonight Stories Left to Tell opens its 3-night run in the McGuire Theater. 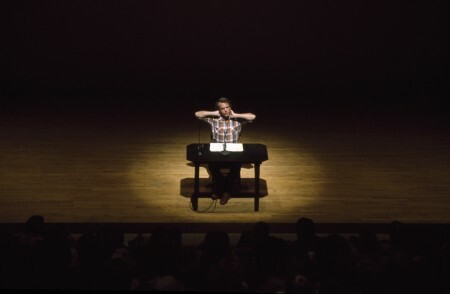 Like “the structured unknown” Spalding Gray believed he was throwing himself into with every performance, each show this weekend has a featured guest, and a script (structure), but the “raw and unmediated thing-in-itself” still awaits. Stories Left to Tell is partly a re-assemblage of Gray’s words re-selected for performance. These selections were chosen by Gray’s wife, Kathleen Russo, who realized the lasting power of Gray-the-writer during a well-received reading of his Swimming to Cambodia after his death. Russo crafted from his body of work a new piece of theater, which we have a chance to see in the Twin Cities this weekend. For each of Gray’s performances, he only had a sheet with simple keywords on it to remember which stories he wanted to tell. Without a script or memorized gestures, Gray saw every monologue he delivered as a fresh performance, a form of improv—something that he was reliving and re-experiencing along with the audience. In the book Out of Character, Spalding Gray wrote, “Everyone that is remembering is always putting something together that is always not the original event. The origin is always lost to us forever.” He was writing about his memory-based process as a monologist, but it could just as easily be a prescient summary of the challenges Russo faced in creating Stories Left to Tell. Gray saw his transformation of memory into story, his “re-membering”, as a discernment of the “landmarks on the road from being to nonbeing”. What Stories Left to Tell achieves is a reversal of this road. With a cast of talented performers, Russo has taken us from the nonbeing– the lost origin of Spalding and his words– back to the existence of a living performance. Also tonight, shortly before the show, the 2010 Spalding Gray Award-winner will be announced. The Spalding Gray Award, in the words of last year’s press release for the Award, “supports gifted writer/performers who fully realize both aspects of Spalding’s legacy: who are fearless innovators of theatrical form and who reach into daily experience and create resonant, transcendent work that makes us all bigger, wider, wiser and, somehow, more than we were when we entered the theater.” The Award is presented jointly by PS 122, the Warhol, and the Walker. Previous recipients include Heather Woodbury (2006), National Theater of the United States of America (NTUSA) in 2007 (part of Out There 2009), and Radiohole in 2009 (part of Out There 2010). We’ll let you know the 2010 recipient sometime over the weekend (check back for a comment on this blog post).